Chantel Keona has worked with various brands including Filly Flare, The Color Workshop, OPI, Nicole by OPI, Qosmedix, Mirabella Beauty and more Chantel is always interested in collaborating with other bloggers and brands. Advertise on Chantel Keona: We offer many advertising packages for your product or service. Simply send and email for more information. Product Reviews: Chantel loves to share the hottest and newest in style and beauty with her readers, she will always give her honest opinion. Contact us about having your product on featured Chantel Keona. Social Media Promotion: Chantel Keona is a social media maven and loves to promote your brand, product or service on all social media accounts. Contact us if you would like your company promoted by the best. 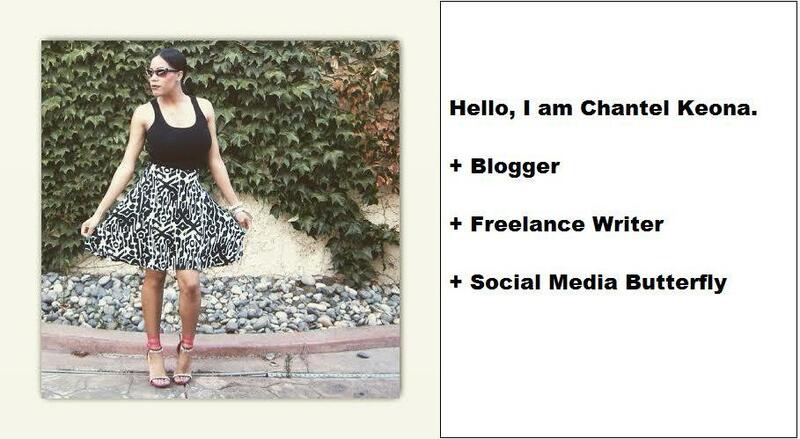 Twitter Chats: Chantel Keona is available to host twitter chats on your company’s behalf. Contact us for more information. *Please send us an email for our fees and price list.